Lelantos was regarded as a second generation Titan, with the supposition made that he was the son of the Titans Coeus and Phoebe, although this is not specifically attested to in the ancient sources. 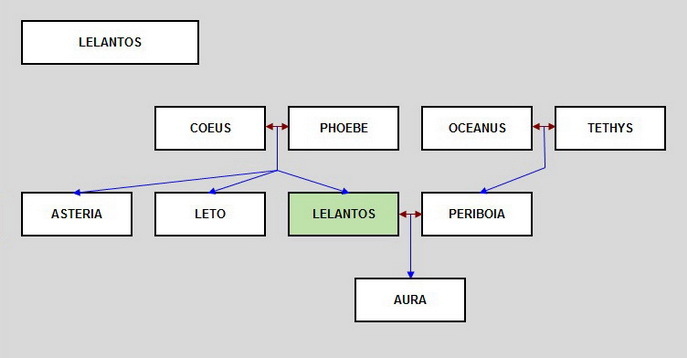 If though, Lelantos is a son of Coeus and Phoebe, then he was also brother to the more famous goddesses, Leto and Asteria, with Lelantos being considered simply to be the male equivalent of Leto. ​Lelantos was regarded as the god of air, breezes and the unseen; although other more famous gods were also associated with these, Aether being air, the Anemoi being the winds, and the Aurai were Oceanid nymphs of breezes. Lelantos was married to the Oceanid nymph Periboia, and the pair were thought to reside upon the Lelantine (or Lelantian) plain of Euboia. There, Lelantos would become father to Aura, the Greek goddess of the cool air of the early morn.